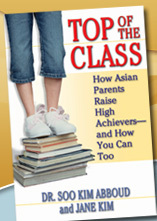 TOP OF THE CLASS teaches parents how to get their kids to excel in the classroom. After learning the seventeen secrets outlined in our revolutionary new book, you will be able to turn even the most bored, average, or underachieving student of yours into a motivated, lifelong learner with grades to be proud of! Available now in bookstores everywhere.